Rose Quartz is a remedy needed by those who struggle with love and being loved, with spirituality and universal love, with self-love and giving love to their family members and others. Overburdened with responsibility, enmeshed and lost in care for others, with loss of identity and self – these themes speak strongly through the language of Rose Quartz. This is a gorgeous book which acts as 'smaller sibling' to Peter Tumminello's original work Twelve Jewels, and which I was lucky enough to review for this journal (Autumn 2007). Unlike the original book, this edition isn't published on art weight paper, which means the book is considerably lighter in weight and less expensive to purchase. However the quality of the pictures and photographs are impaired slightly from this change in media but, that said, the images are still acceptable. In the introduction of the book, Peter Tumminello states that it was soon after the pulication of Twelve Jewels that he realised he had 'omitted a vitally important gem'. He found that many women, in particular, were drawn to this stone and that his masculine identity rejected it! With this insight he decided to prove Rose quartz and quickly introduced it to his practice in Sydney, Australia. Early on in the book, there is a brief chapter describing Peter's proving methods and his unique immersion technique. Peter uses an uncut, authentic whole gemstone as he believes that the trituration of such a beautiful object can 'compromise' its authentic healing capacity. As a lover of crystals myself, I find that this belief resonates with my own views. The first section of the book covers all then practical aspects of the gem - its chemical constituents and its signature, alongside the proving method. 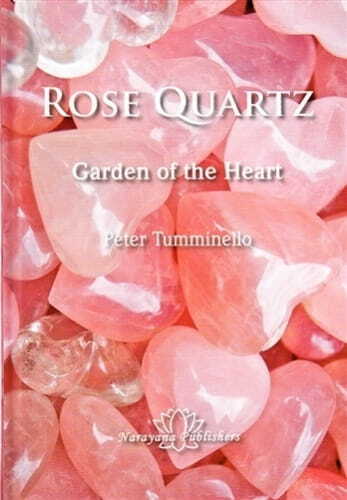 According to Peter, a significant Rose quartz signature is that it is not a stand-alone crystal, thereby signifying that the medicine is indicated for having no boundaries around love ...' Then, as the book moves on into the concepts / themes that emerge from the proving, this signature is explored by the expression of symptoms. Interestingly, throughout this text, Peter refers to any symptoms in the feminine; this is to emphasise that Rose quartz acts on the emotional field and consequently is often most useful in treating women. But it should be noted that he also stresses that it is not exclusively a female remedy and that it does work on the feminine aspect or 'feeling part of the male persona'. As with all remedies, it is important that the remedy matches the symptoms being expressed by any individual and not allocated due to gender. A key theme to materialise from the proving is a feeling of responsibility for the family, the need to create a harmonious atmosphere, to act as the peacemaker, often sacrificing her needs and self in the process. Having read that chapter I could quickly see how valuable this remedy could be in any practice, and indeed for practitioners too! One of the provers is quoted as saying 'thoughts of several very persistently demanding and time-consuming patients'. The sense of need for security also seems to be a significant factor in this materia medica picture. Peter explores this in relation to a financial need and the desire to provide for the family unit and how this may manifest as women who are juggling a demanding career and managing a household. Interest­ingly, he also compares this to the extreme pressure many young people experience around examinations. This constant push by educational establishments for top marks can result in extreme examination nerves and Peter says that Rose quartz should join other established remedies within this rubric. The book contains a list of all 'generals' produced from the proving; the spiritual elements; as well as affinities; food and drink desires and aversions, and dreams. I particularly enjoyed the dreams chapter. Peter lists within this section the themes of animals (eagles, owls, horse, sheep and wolf) and colours pink, gold or orange, and he points out that these three colours are often likely to be worn by the patient in need of this remedy - a handy hint! Peter demonstrates the similarities of this new remedy by comparing and contrasting it with Ignatia, Carcinosin and Aurum. The final section of the book contains some case examples of the remedy in use. This is a great section to see how the symptoms and materia medica picture, debated throughout the book, may actually be experienced by the client, and shown to the therapist, in the consulting room.I found this book very easy to read; it clearly explains the remedy and how valuable it may be in practice. I would definitely recommend it.